The education level of Warren’s population is a little like the age issue. Taken just as the overall median, we are 2.4 percentage points below the national composition of 86.7% of the population having at least a high school diploma, and this is a big improvement since 1990 when we were more than 7 percentage points behind. But it is important to look deeper, which, unfortunately, reveals that Warren’s youngest residents have fallen very far behind the nation. The gap is nearly 10 full points in the 18-24 age group, and 7.6 points in the 25-34 group. Statistically, these are enormous gaps. Why is this? Again, the census provides no answers, but I think it is safe to say that we did not suddenly start producing less motivated students 30 years ago; it is far more likely that the gap is there because so many of our high school graduates leave Warren at an early age to look for opportunity. This brain drain is no doubt part of the reason we fall even farther behind when the bar is raised to look at the composition of our population who are college graduates. 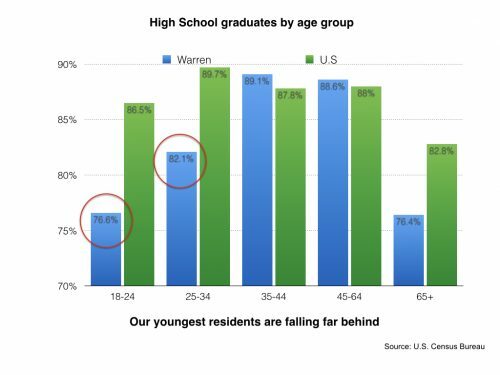 Warren’s residents are less than 40% as likely to be college graduates compared to the national average. And unfortunately, in this category we are falling farther behind as times goes on, rather than catching up. 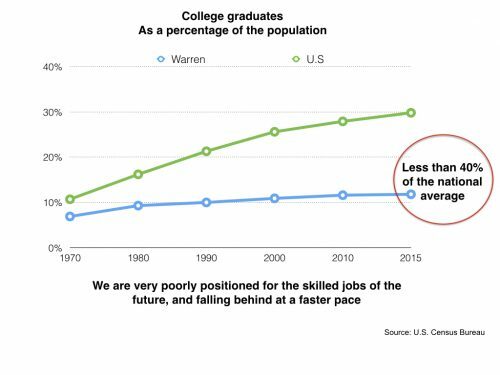 If the good jobs of the future are truly reserved for the better educated, we are very poorly positioned for the future. A recent article in the New York Times by J.D. Vance, who wrote the current best seller, “Hillbilly Elegy” talks about this phenomena, which is another story I heard countless times when I was knocking on doors. So many older people were proud to tell me how well their sons and daughters are doing in Arizona or South Carolina, but there was always a note of sadness in their voices because their children, and grandchildren, are so far away and they know they are never coming back. Posted Monday, March 20th, 2017 under Economic development.